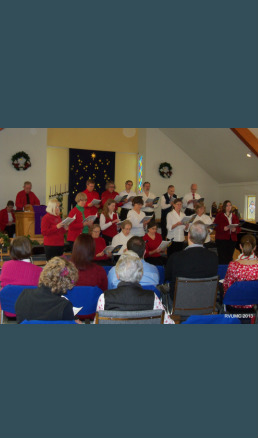 RVUMC is blessed with a very good choir, always looking for more members, and other musically-inclined parishioners who play for services as well. Twice a year, at Christmas and Easter, the RVUMC choir and other singers and musicians from our area--some from other churches and some not--join to perform Cantatas by contemporary Christian composers. We take great joy in opening our sancturary to host concerts by local musicians and choral groups. Please contact us if you would like to perform at RVUMC. Saturday, March 31, 2 pm: Cantata "No Stone Could Hold Him"
RECENT CONCERTS:Saturday, Dec. 16th,: Community presentation of Cantata, "Take Me Back to Bethlehem"
Monday Dec. 4th, 7:30: Catskill Glee Club returned. Last year's Easter cantata was "Come, Walk With Me" by Pepper Choplin. Classical Piano with Charles Ryu (Beethoven, Chopin, Schumann) FRIDAY JANUARY 15TH 7 p.m. Donations were accepted for "Imagine No Malaria"